Come with me on an adventure to China. China is a huge country with vast beautiful countryside, giant dense cities, and some of the best food in the world. I've led groups dozens of times to different regions and each trip reminds me of why I love this country so much. The ancient culture, incredible hospitality, and the friends I've made all over China make every trip a new adventure. I'm especially excited for this trip, where we'll hike the stunning Tiger Leaping Gorge, trek through abandoned areas of the Great Wall of China, and meet up with Chinese friends all along the way to see the true China. On each hike, we'll also be raising awareness for Project Partner, helping end the poverty crisis in rural China. Come with me on this adventure next year. Guilin - April 6 - Day 2 - Arrive Guilin evening. Transfer to hotel to beat the jetlag. Overnight Guilin. Guilin - April 7 - Day 3 - This morning we'll get up early and travel with friends of Project Partner for a hike at a village on the Li River. We'll take an easy hike along the river through a few small Chinese villages. After our day hike (about 4 hours on easy terrain), we'll transfer to XingPing Old Town for dinner. Return to hotel and overnight Guilin. Guilin to Lijiang - April 8 - Day 4 - After a late morning breakfast, we’ll take a flight from Kunming to Lijiang. Depending on flight times, we’ll transfer to the hotel and potentially have time to explore the Old Town of Lijiang. Take an early evening in preparation for the early morning hike tomorrow. Overnight Lijiang. Lijiang and Tiger Leaping Gorge - April 9 - Day 5 - Today, we’ll begin the morning early and drive about two hours to the start point of the hike at Tiger Leaping Gorge (altitude 1790m). The hike begins with a two hour hike to Naxi’s House, a beautiful guesthouse where we’ll stop for a short lunch break. We’ll then continue through the 28 Zigzag switchbacks which take us to our overnight guesthouse at 2650m. Overnight guesthouse. Tiger Leaping Gorge - April 10 - Day 6 - After breakfast at the guesthouse, we’ll descend down into the gorge and finish our hike in the afternoon. We’ll drive back to Lijiang and overnight Lijiang. Xi’an - April 11 - Day 7 - An early morning flight (2 hours) will take us to Xi’an, where we’ll take a Panoramic City Tour of Xi’an. We’ll visit the Bell Tower, which dates back to 1384 and is the largest and best preserved of its kind. Then we’ll head to the Ancient City Wall and finish with a stop at what has become an emblem for the city, Big Wild Goose Pagoda Park, first built by the Tang Dynasty. 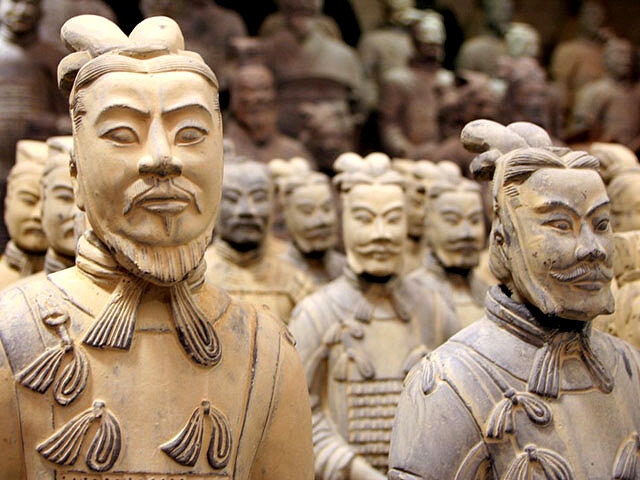 Xi’an to Beijing - April 12 - Day 8 - In the morning, we’ll visit the most famous of Xi’an artifacts: the Terracotta Warriors and Horses Museum. One of the most important archaeological finds in the twentieth century, this army of terra-cotta warriors and the bronze chariots entombed in vast underground vaults date back 2,200 years and are truly spectacular. After our visit to the museum, we’ll board a train for Beijing, giving us a chance to take in the sites along the way to China’s capital city of the north. Overnight Beijing in the Hutong district. Beijing - April 13 - Day 9 - Today we’ll visit Tiananmen Square, the largest city square in the world. After our guided visit, we’ll travel to the very near Forbidden City. As the largest imperial palace in China for 24 emperor’s reign during the Ming and Qing dynasties, this UNESCO World Heritage site is amazing. Finally, we’ll visit the Summer Palace, the 800 year old largest and best-preserved royal garden in China. Beijing -April 14 - Day 10 - We’ll depart Beijing proper for a hike on the Great Wall of China, ending at the Mutianyu gate. The hike will take most of the day and take us through the countryside on this wonder of the world. We'll finish the trip with a farewell Peking Duck dinner, the most famous Beijing dish in the world. Overnight Beijing. *Andrew W Lyon Travel can help book your flight to China or you're welcome to book your own flight and meet the group at the first hotel in Kunming. Feel free to contact Andrew W Lyon Travel team representative for Kristen Levitt's flight itinerary if you'd like to arrive on her flights and transfer to the hotel in Kunming with her.